Is your current flooring old and damaged? Now is the perfect time to replace it with the attractive and comfortable carpet flooring available at our carpet store. We feature a handsome array of carpet flooring in many textures and patterns. Come by our showroom and peruse our beautiful collection of styles, colors, and textures. We have a friendly and knowledgeable staff that can help you choose the perfect carpeting for your home. 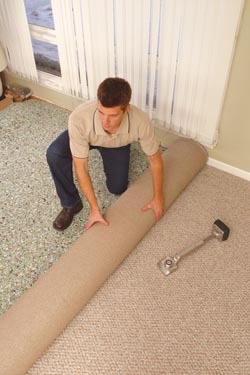 You can also count on us for carpet installation services once you settle on the carpeting you want. Competing carpet stores in the area can’t compare to our low prices and outstanding customer service. We are committed to helping local homeowners make their flooring dreams a reality, elevating the aesthetic and overall worth of the property. Whether you are redecorating a room or two, or selecting floors for a new house, our experts guide you through our extensive carpet options to find what works best for you. Whether you prefer classic colors or a modern aesthetic, our selection accommodates even the most selective homeowner. We offer a wide array of carpet flooring that is able to complement your décor and match the vision you have for your interior home design. Our carpet store has the flooring you need that best fits your needs in looks, performance, and price. Check out our impressive collections of carpeting—from economical, stain-resistant to plush, soft textures, we can find the ideal choice for your home. Berber carpets have a timeless appeal. The style is distinguished by a loop pile construction that is reminiscent of traditional woven Berber carpets that were hand-woven centuries ago. The design of the carpeting fibers gives Berber carpets a soft texture that is cushy under the feet. In addition to their aesthetic appeal, Berber carpets are also very durable. They are an excellent choice for rooms with a lot of foot traffic, and since they are stain resistant, they are a popular choice of carpeting for households with children. If you want a good deal on flooring that is comfortable and resilient, consider getting Berber carpet. Two of the most popular brands of carpeting at our carpet store include Downs™ and Tigressa™. Downs has been a trusted company for four generations, and its carpeting has become known for superior construction and exclusive styles. All of the Downs carpets at our store have a five-star rating, and they are backed by our outstanding warranty options. Tigressa carpets are perfect for the person who wants it all. The advanced yarn engineering process creates carpeting that is incredibly strong, resistant to fading, and luxurious to the touch. The carpet fibers have a smooth appearance that makes for an attractive surface, and the thin filaments give them an ultra-soft texture. Your beautiful new Tigressa carpet will last a very long time with just routine cleaning. The fibers are engineered to resist matting and crushing, so you do not have to worry about the carpet becoming worn with use. It also has a patent color-enhancement process that gives the carpet fibers richer colors that do not fade with time. Tigressa carpet flooring is not only great for our customers, it is also beneficial to the environment. The carpeting is made from recyclable materials, which means you can recycle your Tigressa carpet if you ever decide to replace it. The manufacturing process relies on natural, renewable materials, so it does not require the use of precious resources to make Tigress carpeting. We are proud to offer these eco-friendly carpet options at very affordable prices to our customers. Our carpet store delivers the entire flooring package. In addition to providing clients with quality floors, exceptional customer service, and expert flooring guidance, we offer professional carpet installation services. Our experienced contractors have the skills and knowledge to properly remove your existing floors and install new ones. The result is neatly installed flooring that last years. Contact us today to discuss the type of carpeting you desire for your home. We proudly serve clients throughout Jackson, Jackson Hole, and Wilson, Wyoming.